How many times do you thank people every day? Even if you are thankful for something small, by sending a thank you card will raise the spirits of a person who did something nice for you. 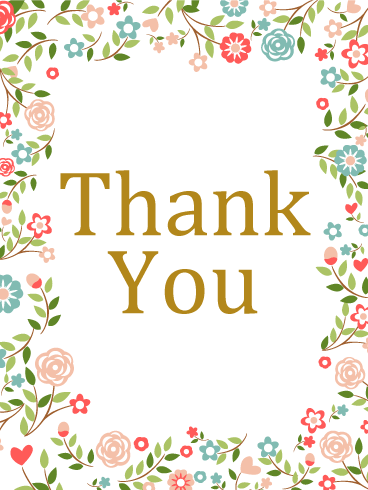 This Thank You card is the perfect combination of simplicity and elegance. Just take a look at that background... the dark and pale pinks look beautiful together, and the verbiage is heartfelt without being over-the-top. This is a great choice for anyone you want to say "thank you" to. This gem of a Thank You card is the perfect balance of simple and fun. 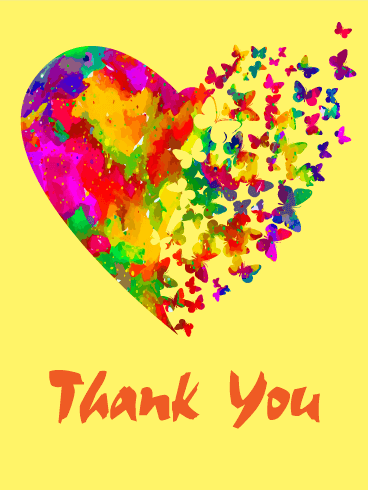 The abstract painting of the heart and butterflies is stunning, while the simplicity of the "thank you" message allows you to personalize this card however you'd like. This makes it suitable for any occasion, and, let's be honest– everyone's bound to love this gorgeous card! Like peanut butter and jelly, peaches and cream, or cookies and milk, your loved one and their partner make the "perfect pear!" 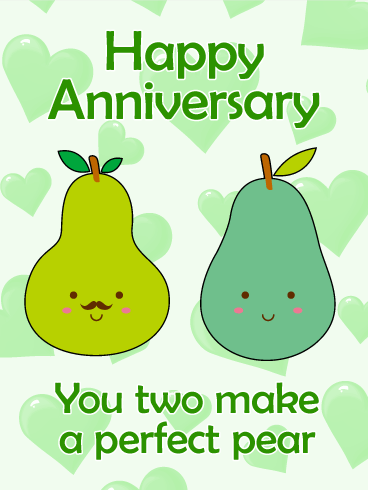 As they celebrate another year together, use this Happy Anniversary card to send your well wishes. The cute design will bring smiles and laughter to their special day and the sweet gesture will show them how much you care. 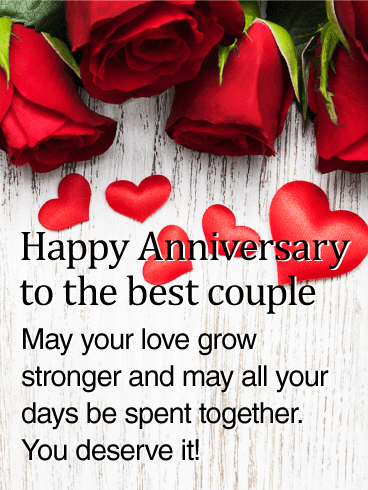 For the special someone in your life, you can't go wrong with this anniversary card. 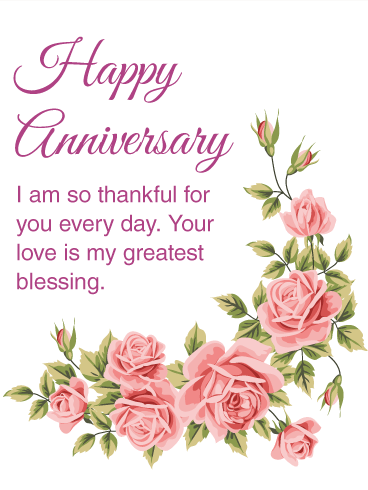 If you have a hard time expressing how you feel, this anniversary card is a great choice to make sure they know you care. The design is beautiful, and the words are heartfelt. This anniversary card is always a favorite, and it's easy to see why. The breathtaking roses and heart-shaped petals capture your attention, but the real beauty is in the message. Our hearts just melt every time we read, "May all your days be spent together". This love card is perfectly sweet and simple. Just look at that delicate rose! This is a great choice for everyone from your mom and dad, to that special someone in your life. The sentiment is sweet, while leaving enough room to tailor it based on the person you're giving it to. 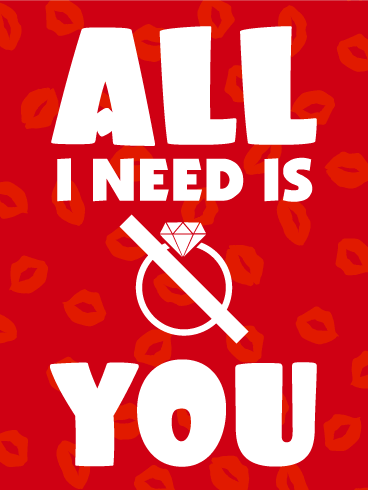 This love card is great for a significant other, but can also be a stellar choice for a close friend or family member. If you want to thank someone who's always been there for you and let them know how much you care, this is the love card for you! The muted, delicate flowers add a rustic elegance to the love card, and its sweet sentiment is sure to make anyone smile. Rings, chocolates, teddy bears, bracelets... All of these are great gifts to receive from the person you love most, but the only thing you really need is your sweetheart. To show your love how much you adore them, send this funny love card to celebrate your relationship and special connection. The sweet message will warm your partner's heart and show how much you care for them. The vast blue sky meeting the ocean beautifully symbolizes the endless cycle that continues on, along with the spirit of the people we love. This is a comforting thought to help carry someone through a difficult loss. It's a reminder that by having a support system by their side and cherished memories in their heart, they'll continue to grow stronger and find peace in the days ahead. 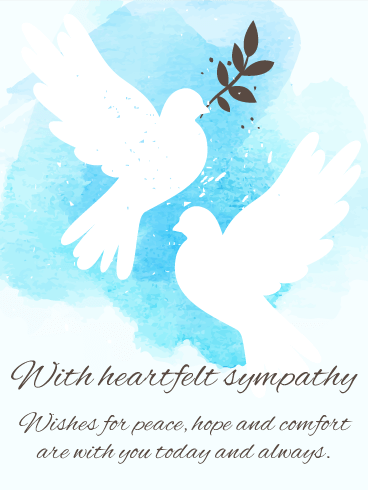 Doves are symbolic of peace, which is a fitting tribute for this beautiful card. The message is one of hope, a touching reminder to a friend, family member, any special person in your life that things will continue to get easier, and that you will keep them in your heart each day, offering encouragement and love. 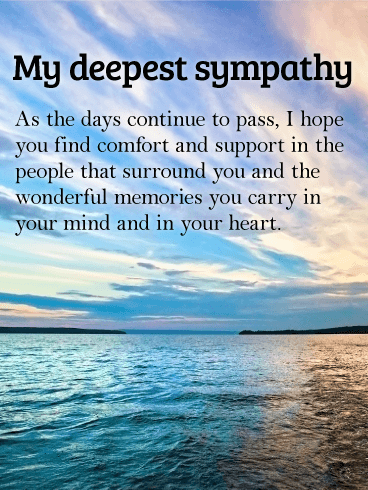 During a dark time in someone's life, it's important to let them know that brighter days are ahead, and that each one gets easier as long as they hold onto the precious memories of a loved one. 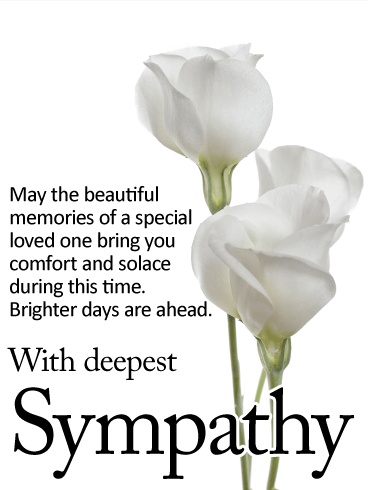 Beautiful, elegant white flowers, symbolizing purity, adorn this touching card, which will provide comfort and support when they need it most. Is there someone on your mind? Do you want to let them know that you are thinking of them? Send them this Thinking of You card! The sky blue background features a bouquet of blue, purple, and white flowers - the best way to send well wishes to your loved ones! "Thinking of you..." is written in purple cursive, the perfect message for this sweet card. 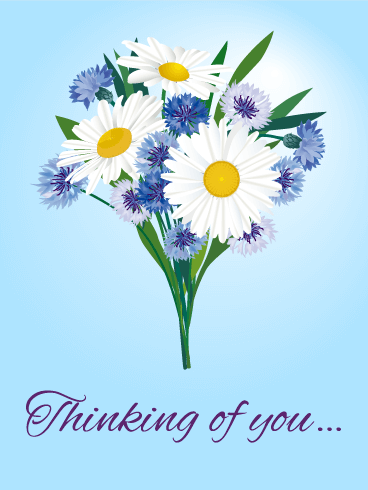 If you are thinking about someone you love or know someone who can use some cheering up, send them this card to say, "Just wanted to let you know that you are on my mind..." This Thinking of You card features a bright blue, sunny sky behind colorful yellow and violet wildflowers. Send some sunshine and beauty to brighten your loved one's world today. 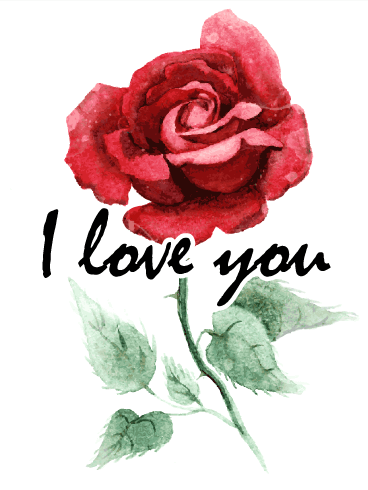 Red roses hold several meanings, including a way to show love and respect. 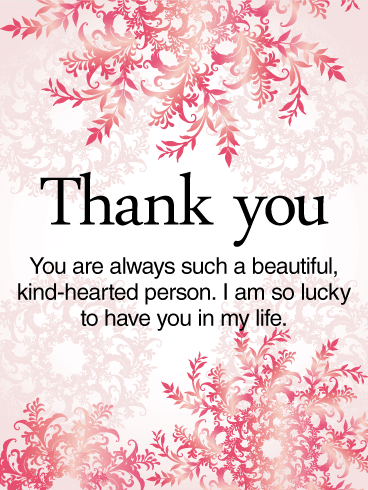 Use this Thinking of You card to show your friends and family how much they mean to you. The card features a large, beautiful bouquet of red roses in a white pitcher, which is tied with pink ribbons. Say "I'm thinking of you." 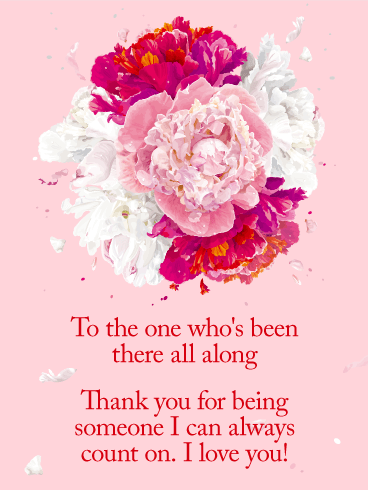 to the ones in your life who need it most with this beautiful card! Getting sick is not much fun, but having friends who care is the best way to get better quick! If you have a friend or family member who is feeling under the whether, send them this funny get well card to help them get better soon. 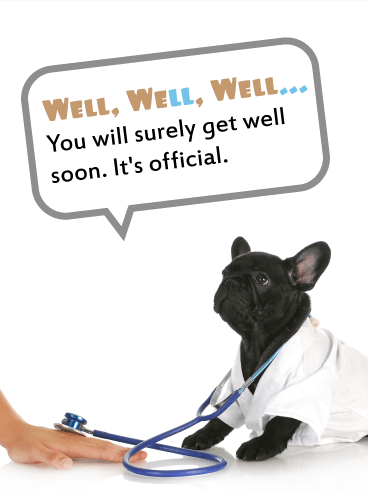 Laughter is the best medicine, so the "doctor" on this get well card will make them feel better faster! Tulips were once seen as a symbol of charity during the Victorian Era, but they are also a symbol of love and good wishes. 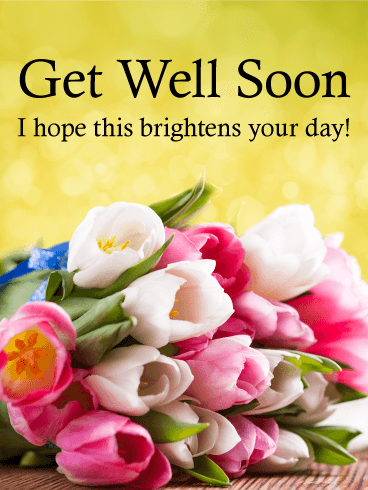 Send this Get Well card to tell a sick loved one you hope they feel better. The bright colors and "Get well soon" message will lift their spirits and help them get over their sickness sooner! Send it today! Flowers have been used for centuries to express well wishes and send love to those who are away or ailing. 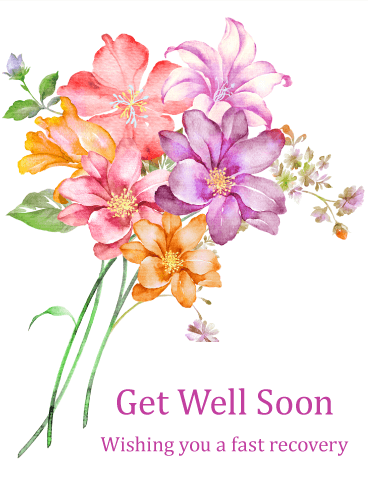 If you have a friend or family member who is feeling sick, use this Get Well card to wish them a speedy recovery! 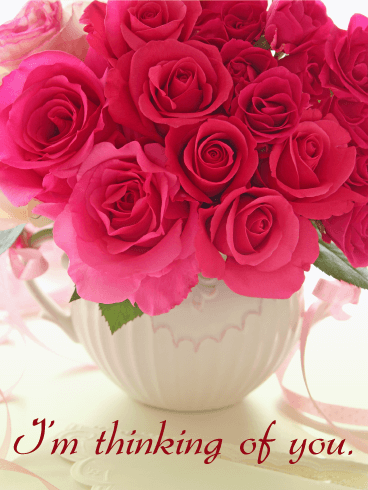 The gorgeous flower bouquet that is featured on it will convey your heartfelt well wishes and let them know you care. Tonight, every star shines for you. That's the message this gorgeous card expresses. Wish someone you know all the happiness in the world for their hard work and achievement with this starry night congratulations card. A congratulation greeting card is a simple way to convey heartfelt pride to someone who deserves it. 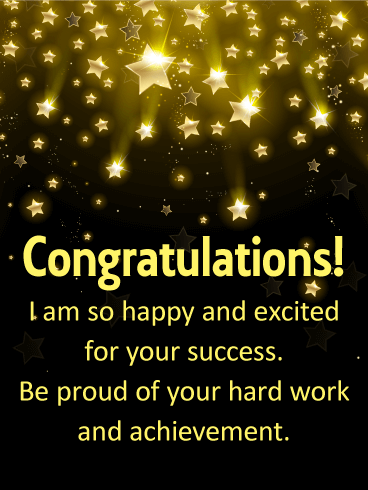 Let them know how excited you are for them, and send this congratulations card with a hundred falling stars to wish upon for good luck in the future! Do you know someone who just graduated, got a job promotion or achieved a big accomplishment? 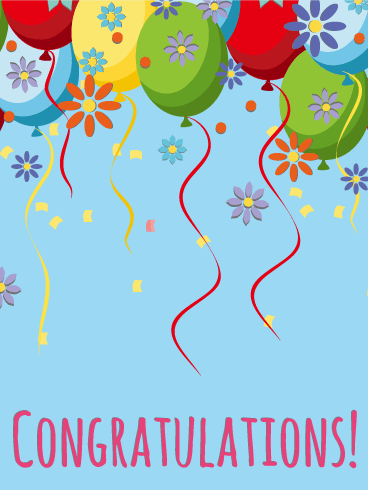 If so, then say congratulations with some humor by sending this cute and funny congratulations card out today. It will surely add some laughter to their day. 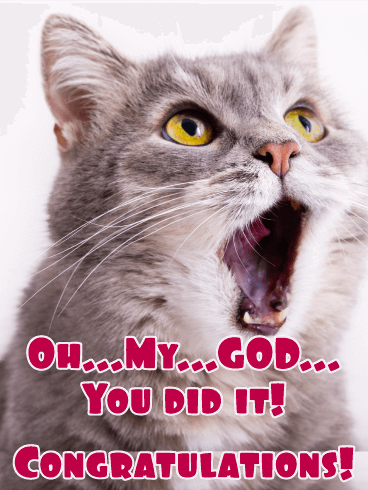 The message along with the surprised look on the cat's face will definitely make someone's day, as well as remind them that you cared enough to send such a great card. Flower power congratulations! This fun-loving and spirited congratulation card is great for any occasion, and sure to bring a smile to everyone's face. Carefree flowers and balloons float up and away bringing warm wishes and hearty congratulations to the receiver. What are you waiting for? It's never been easier to say "Congrats!" than with one of our specially designed cards. Do you have a best friend? Are they the greatest person you've ever met? 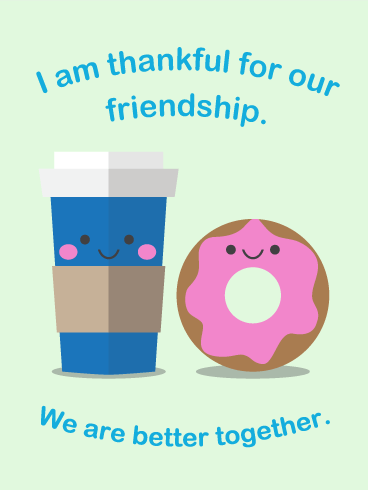 Show your friend how much you appreciate them with this cute friendship card! The silly design will make your friend laugh and the sweet message will show that you want this friendship to last forever. 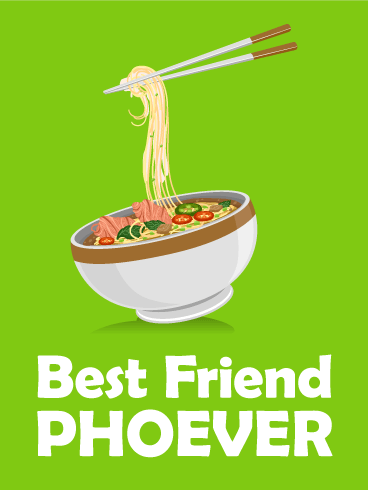 Send this friendship card to celebrate the best friend you've ever had today! There are just some things that belong together. Peanut butter and jelly. Spaghetti and meatballs. Doughnuts and coffee. And add to that list you and your special friend! So let them know how much you love them with this adorable friendship card! Few things make trips to the beach better than being with friends and family. Remember the cookouts you had, the sports you all played, and all the laughs at the beach? 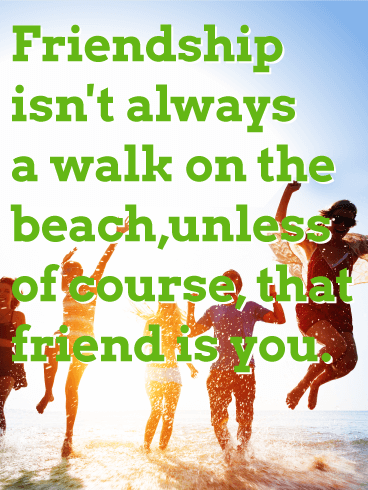 Memories of the wonderful times you shared at the shore will never be too far away when you give this friendship card. Send it to a friend today and let them know that it's always sunny when they're around. Is your partner away from you today? 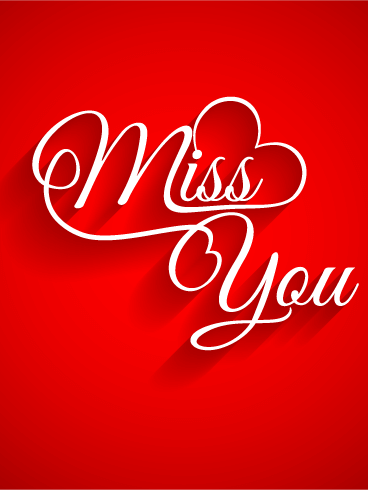 Let them know how much you miss them with this beautiful Miss You card. The background is dark pink on the bottom and filled with circles of red, yellow, orange, and white at the top. Shining pink and white hearts are mixed with the circles and "I miss you" is written in white at the bottom. 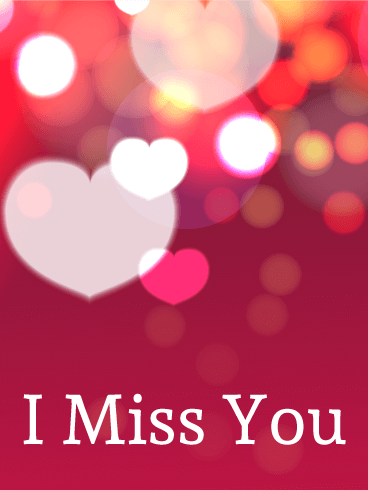 Send this card to the person you love and miss today! Maybe roses have thorns to teach us that even the most beautiful things in life can be painful or have flaws. That's a good lesson for when you have to be separated from someone you love. Love is beautiful and amazing and missing them is the thorn. Let them know that they're still in your heart. 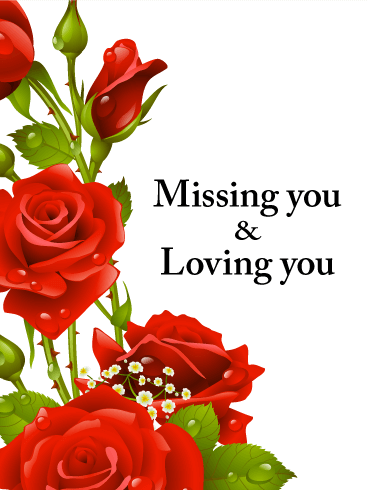 You could send flowers to let them know that you miss them, but sometimes words say it best. Sometimes you can miss someone so much that it feels like you can't breathe. Your thoughts are filled with them and the next time you get to see them. That's a tough thing to experience and there's nothing that will magically make it all better. You can make it a little better but sharing your feelings with them. Let them know they're in your thoughts even if they're not in your presence. You never need a reason to say hi to your friends and loved ones. 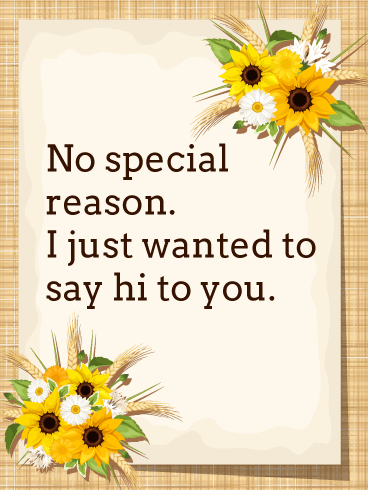 If you have had someone on your mind, send them this Saying Hi card to let them know. The card is designed to look like a handwritten note, with two bouquets of sunflowers, daisies, lilies, and grasses on opposite corners. Say "No special reason. I just wanted to say hi to you." with this pretty card! Have you spoken to your mother, grandmother, or partner lately? If not, send this beautiful, classic greeting card to say hello! The background is a pretty light tan with a large bouquet of red flowers at the top. 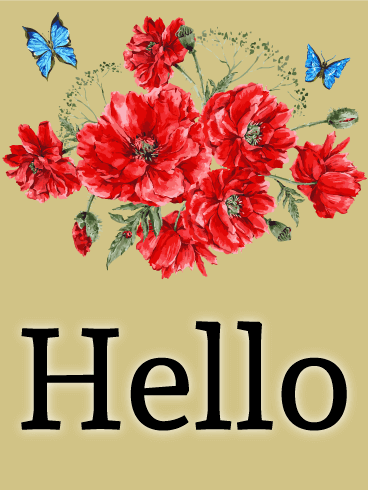 Blue butterflies dance around the blossoms and buds and "Hello" is written in black below. Send this card to the special women in your life and let them know they are on your mind. When was the last time you sent a word of greeting to your friends, coworkers, or family? 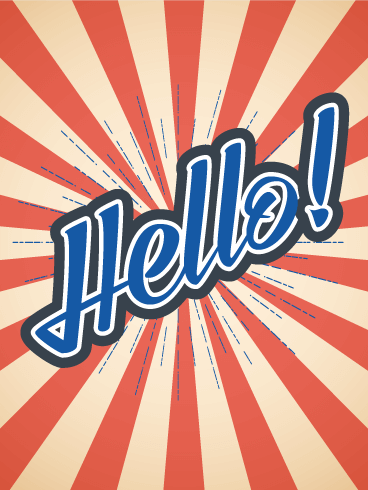 This Hello Greeting card is the perfect way to do it today! 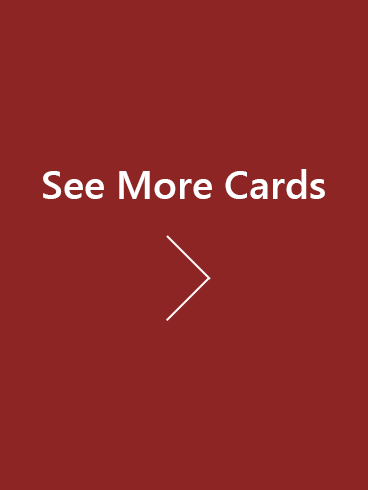 The red and cream stripes in the background will make this card pop off the screen. Blue sparks surround the blue "Hello!" message written in the center. 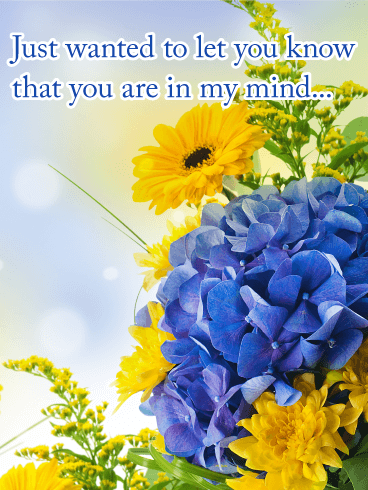 Choose this exciting card to send your greetings to those on your mind today!